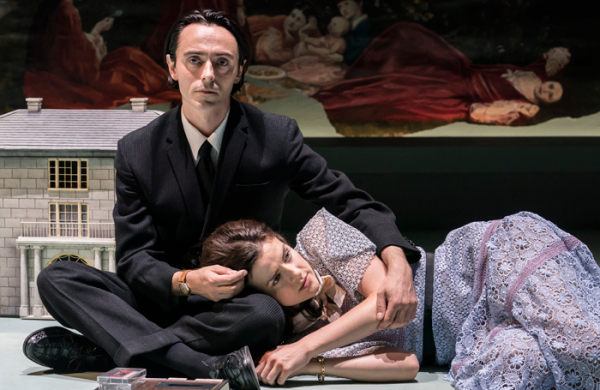 A ghostly reminder: Ed Nightingale reviews a revival of Brian Friel’s Aristocrats. Aristocrats at the Donmar Warehouse. Photo: Johan Persson. Poor Uncle George. He barely says a word throughout Brian Friel’s Aristocrats. Instead, actor Ciaran McIntyre spends his time slowly peeling back the green surface of the back wall to reveal a mural beneath of a stately home foregrounded by a family picnic. Watching him picking and peeling away is strangely transfixing, perhaps even more so than the family drama that takes place in front of him. This dramatic device sums up this Donmar revival of Friel’s 1979 play in more ways than one. It’s a play about a dysfunctional Irish family living in a fantasy of the past, whose layers we must peel back to find the truth. That past may have been glorious but it’s now the static backdrop to the O’Donnells’ future, a ghostly reminder of what used to be that looms over them. Three sisters and their “peculiar” brother Casimir (David Dawson) are brought together to celebrate a forthcoming wedding, drinking, eating and debating in the gardens of their family home with their respective partners. The family’s wealth is under threat as their father is terminally ill and speaks overbearingly from his bed through an intercom – the house, too, is physically decaying. They are joined by an American scholar, Tom (Paul Higgins), who studies the dying Irish aristocracy – he is, like us, detached from their world. It’s an imaginary game of croquet during the first act that best illustrates the dysfunctional O’Donnells: a game distinctly for the upper class, yet visible only in their minds. Dawson’s Casimir most keenly represents the family’s loosening grip on reality. He jerks and fidgets around the stage, overtly artistic and eager to impress. He is an eloquent speaker but also a compulsive liar, his new life in Germany perhaps as much of a fantasy as his recollections of the family’s past. Of the siblings, Casimir is the most interesting and engaging. Elsewhere Elaine Cassidy is a compelling watch as the loose alcoholic Alice, and as matriarchal sister Judith, Eileen Walsh gives a tragic yet stoic performance of a woman bound by familial duty. The remaining characters, though well acted, are less fully drawn. That painting, though, is also emblematic of director Lyndsey Turner’s overtly artistic and theatrical interpretation. The cast are on-stage throughout, seated on the periphery, and stage directions are read aloud to introduce each at the start of the acts. A dolls house is used to symbolise the family home in an otherwise starkly green, bare, minimalist set from designer Es Devlin that lends the play a cold and clinical feel. Turner’s production is a blanket of modernism covering the richness of history, without giving Friel’s work fresh relevance. Despite a fine cast, there are few moments for the audience to truly engage with the emotional weight of the characters’ plight. We are intrigued but at a distance, viewers in a strange art gallery who are never fully drawn in. The Aristocrats is on at the Donmar Warehouse until 22 September 2018. Click here for more information. Cast includes Elaine Cassidy, David Dawson, David Ganly, Paul Higgins, Emmet Kirwan, James Laurenson, Aisling Loftus, Ciaran McIntyre and Eileen Walsh.